Though this not a good time to invest for long term, Praj Industries is looking good for both short and long term. Yesterday it's price moves past of both 21 & 200 days simple moving Average. 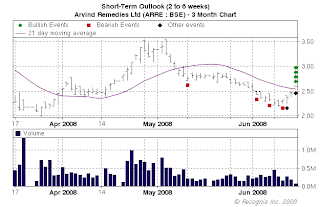 A penny stock looking good at charts is Arvind Remedies Ltd. But is a very very risky pick as volume started to decline. Trade in Ranbaxy and RCOM as both are expected to volatile.